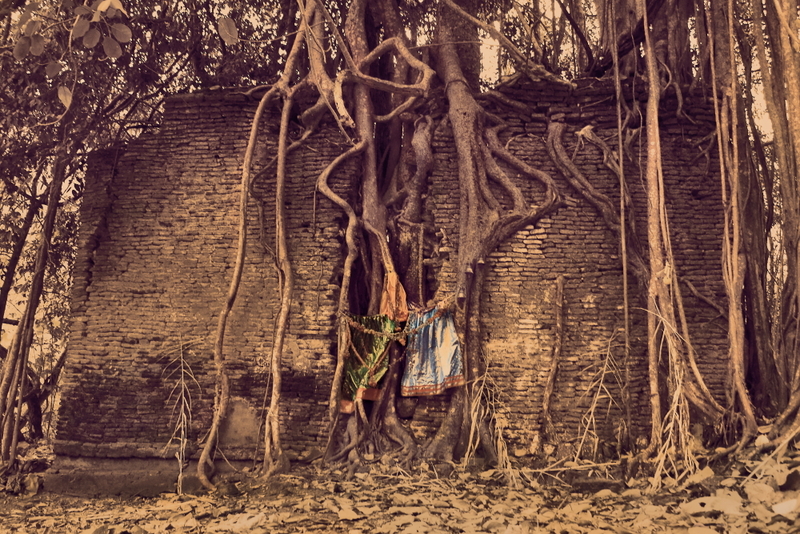 10 Pictures and Stories of Ruins from Across India ~ The Wandering Soul's Wander Tales.. When I saw the movie Tomb Raider as a kid, I was fascinated by the Cambodian Ruins they showed. The fascination intensified when I learned they had maintained Ta Prohm in the same way they found, shrouded in roots. Of course it is a different story altogether here in India, the ruins are not maintained, they are just left. Following my quest to take the road less traveled, I guess I have developed an intense fascination for the abandoned and ruined, for no one cares or writes about them. Ruins have been a fascination ever since. Who knows what treasures it held and what treasures it still holds unknown to us. What memories could've been and what stories stay untold. Through out my journeys across India, never have I consciously missed an opportunity to pay a visit to the disintegrating monuments. So here's a list of what I saw and what I heard. 1. Temple en route Vellagavi - Legend has it that the erstwhile local Robinhood of surrounding area of Kodaikanal hid treasures under this tree. Some claim the kings of yore had buried a huge treasure here. Legend also has it that the treasure has to be retrieved only after following some seven stipulated steps else death would befall upon those who tried in the incorrect way. Either way everyone believes there is treasure buried deep here, under the roots, under the tree. 2. Orchha - There isn't a greater place in ruins that I have seen so far. Every monument here is standing the test of time, on its own, for the government took pains to maintain only very few of the remains. When the king undertaking the construction of these giant cenotaphs died abruptly, the construction was never continued. Today, the grandest of the envisioned cenotaphs lies in neglect and rots inside. Bats take shelter, crooks play inside, even the guards wouldn't bother anymore, for it lies outside the boundary. 3. Rani Ka Vaas, Bhuj - The devastating earthquake that shook Gujrat in 2001 left a trail of destruction in its wake. It is surprising to see this building still standing after the damage it survived. While Prag Mahal managed to retain its strength and shape, Rani ka Vas was destroyed beyond repair or so I would assume. Today it stands shattered and totally in neglect, as a stark reminder of the forces that be, of the one who destroyed and of the one who can probably revive it. 4. Abandoned Havelis of Churu - This place is from a different time and place altogether. It is a small dead part of a town that is otherwise lively. Giant havelis that hosted the rather large joint families of those days lie abandoned and done for now-a-days. The property is split between a complex branch of family tree that no one cares enough neither to sell nor to maintain. Of course it is difficult to sell, for, a gazillion cousins got a room each of the haveli. Dead pigeons fall in front one door and a dead dog in front of the other. One such magnificent haveli boasts of 1100 windows and doors but no one care, no one bothers. The rich owners, the marvaris have left the place and are thriving elsewhere in the world, not here. 5. Hampi - The glorious erstwhile capital of Vijayanagara Kingdom was a fabulously constructed city it seems. The Dravidian temples and palaces won the admiration of travelers from far away lands it seems, until it fell into the hands of the Deccan Muslim Confederacy. Hampi was pillaged endlessly and ruined until the city was abandoned. Today all that remains is the ruins, in a reasonably well preserved state. Even then, the ceilings are falling and the walls are cracking. Not because of some muslim confederacy attacked but because the ruins are not valued enough by those in power. 6. Chiktan Fort - Deep inside a valley, by the raging Indus, with the mountains in the background, stand the stones of a fort that was. I dare not call it a fort for it is merely stones stacked up one one another now. Historically significant, today the significance is no more than a landmark in the far distance. Built by Pakistani craftsmen in the 16th century, today the neglect and natural forces have reduced the fort to rubble. 7. Ghost Town of Kuldhara - Legend has it that Paliwal Brahmins, the occupants of a part of Rajasthan were very adept at business and agriculture. They were thriving and were growing to be quite rich and powerful which worried the Dewan(Prime Minister) of losing his authority and so he levied outrageous taxes upon them. Either that or the fact that he developed a liking towards the chief's daughter, which the paliwals did not traditionally approve of, decided to leave the village overnight. Kuldhara, along with 83 other villages, were abandoned overnight. Today Paliwals are scattered elsewhere and no one has been able to find the 84 villages either. Legend has it these villages are cursed that no one can survive in them, which is probably why Kuldhara still remains a ghost town.Or the myth might shatter if some historian shows some interest. 8. Ghost Town of Dhanushkodi - While the previous ghost town is shrouded in mystery, this ghost town screams of a tragedy. The high intensity storm of 1964 came on its swift wings and took away an entire train full of passengers and an entire village into oblivion. The estimated casualties were 1800 dead people. Today the area has been declared unfit for human habitat but few fishermen still struggle to live off the sea while these walls stand in the sand, as a memory of what happened earlier. 9. Rosary Church, Shettihalli - Of all the ruins that are still standing, this has to be the most fascinating according to me. The church was built in 1860s and when the dam was constructed in 1960s, the village had to be rehabilitated upstream. But the church remained. Not only did it remain, it survived. It survived the wrath of monsoons and of summers. Jaggery and egg mixed in mortar gave the walls its strength is what few claim, the strength to stay submerged during monsoons and emerge in the dry season, year after year. 10. Abandoned houses on Leh - Kargil Highway - I don't know when. I don't know how. I don't know why. I just know they are abandoned houses. War casualties or bunkers maybe, they are just abandoned. No one stays there, except for the walls and bricks and the mountains and the ghosts of the past. And if you are wondering why this fascination with ruins, your guess is as good as mine. I don't know! Or maybe it is because it lets my imagination run wild. Awesome! And not the usual suspects too! Brilliant! Have only been to Orchha amongst all of the above :| Someday, maybe. If you love ruins as much as I do, you should visit these. Wonderful places. Awesome yar...u r inspirational as always.. Awesome post. Loved reading it. Next time you go to Kutch, head to Lakhpat on the extreme west of the district. Rosary Church - Those big chunks on the ground aren't there anymore as last weekend. That is sad, I hope the structure remains for long. nice collection,,you can easily turn into a historian on ruins,,or write down a book on them. Also the photos are great,but dont look as if they were taken by you. Nice :) Shettyhalli had been our usual hangout when in college. Beautiful place! The Danushkodi incident is really heart touchin. Wasn't aware of it earlier. Nice Post! Wow, it will make for a cool story, to be able to say Shettihalli was your college hangout! Even I love that place, a lot. Oh this is a really nice post! Now I want to visit all of them, and find some more along the way! do u really wana explore sumthin new or u just want to explore things already explored ?